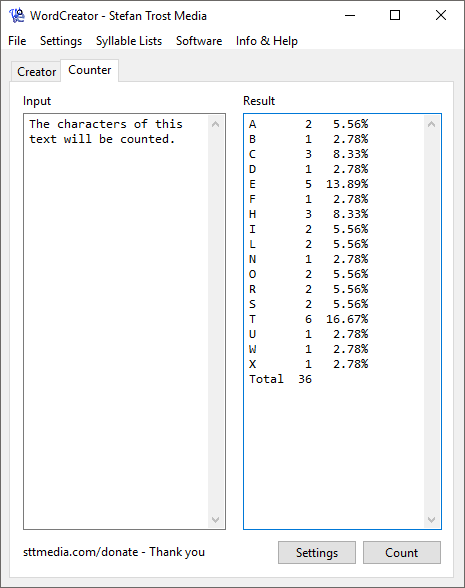 Apart from the possibility to create new words, the WordCreator also contains a counter for letters, other characters, real syllables, entire words or character combinations (digrams, trigrams etc). You can find the counter with selecting the tab "Counter" in the main window. In the following, the functionality of the counter is explained. A list of all functions of the counter with detailed explanations can be found in the section functions. 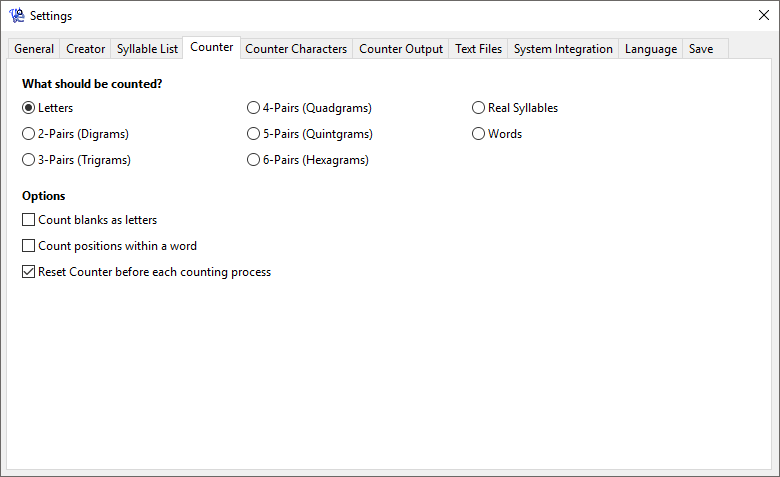 In older versions of the WordCreator, the different functions of the counter were separated, now they are combined. Here you can get more information about the old version. In the screenshot above this text, you can see the counter. Just write a text into the left box (or copy some text into it) and click on the button "Count". You should now see the result in the right box. At the top, you can select whether letters, words, syllables or character combinations (digrams, trigrams etc) should be counted. Beyond, there are some other options. 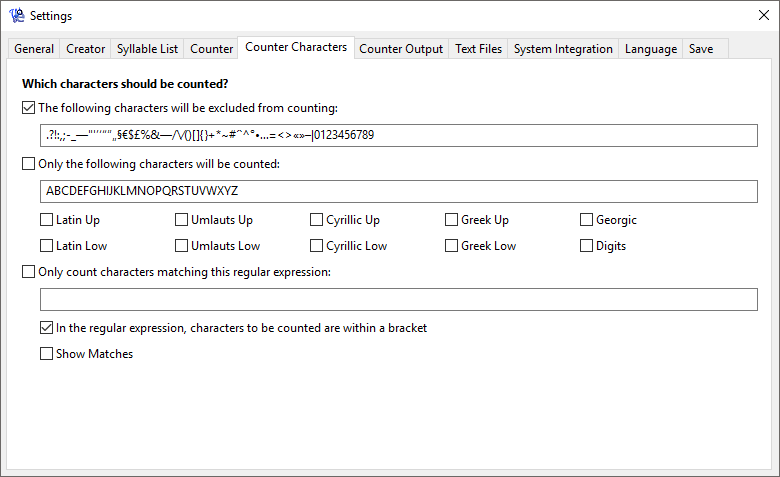 You can find more settings with clicking on "Counter Characters", for example whether specific characters should be excluded or the counting should be limited to some characters. Those settings are displayed in the next screenshot. You can find a detailed description of this functions and options in the function section. The output of the counter can be adjusted on the tab "Counter Output" in the settings. In the following, you can see a screenshot. 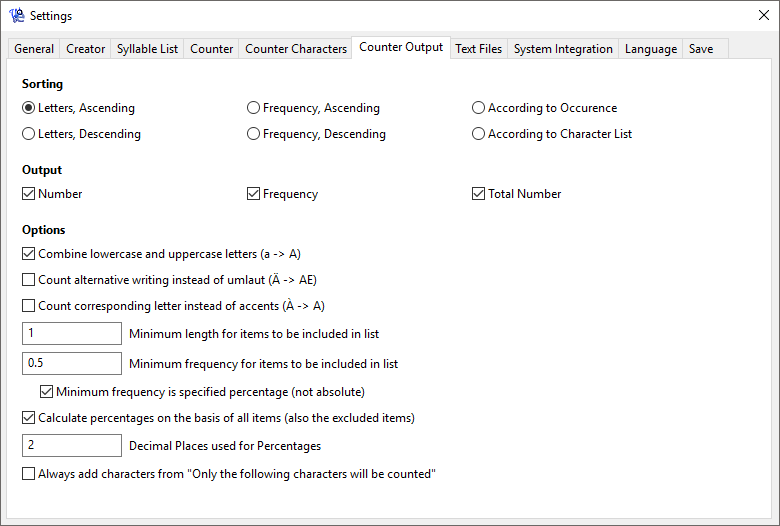 Among other things, you can determine here how your list should be sorted, whether specific groups of letters should be combined in the result (uppercase and lowercase letters, accents etc), how percentages should be displayed or whether you only want to list elements with a specific frequency. Also these settings are explained on the page functions in detail.